Sau. K.S.K. (Kaku) College of Food Technology, Beed has advertised in the LOKMAT newspaper for the recruitment of Teaching Faculty- Associate Professor / Assistant Professor / Principal jobs vacancies. Interested and eligible job aspirants are requested to apply within 10 days from 06th October 2018. Check out further more details below. College Profile: Shree Anant Krishi Vikas Pratishthan, Rajuri (Navgan), Tq. & Dist. Beed is established on 23 November 1994 with the prime goal of making rural life progressive and comfortable, particularly unemployed youth and women through the implementation of various agricultural schemes and training the farmers for better agriculture farming practices. 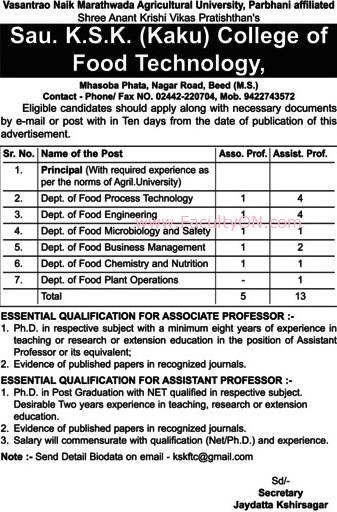 Assistant Professor- Ph.D in Post Graduation with NET qualified. 2 years experience is desirable.